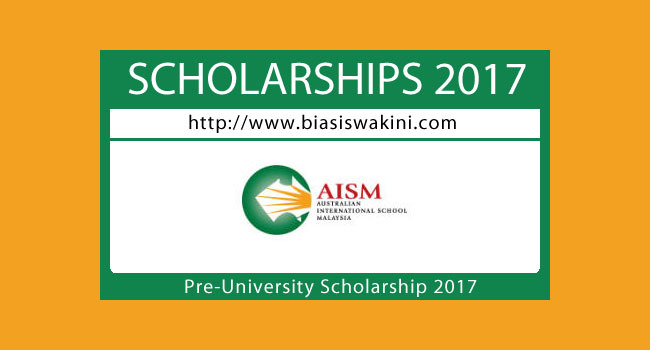 Full Scholarships 2017 are now open for Malaysian students sitting for SPM / IBMYP / IGCSE / O-Levels in 2017. Successful students will enter Year 11 and 12 and sit for the Higher School Certificate (HSC), recognised for entry into Australian, Malaysian, United Kingdom, USA, and other universities worldwide. Scholarships worth RM170,000 for the two-year course will cover Application Fee, Admission Fee, Tuition Fees and Technology Fees. In addition, the scholarship may be extended, depending on student performance, to the Taylor's University for selected Degree courses. The award of the scholarship is based on the strength of the student's academic performance, a strong background in co-curricular activities, sports, arts, leadership and community involvement. Preference is given to those who would not otherwise have opportunity to attend and benefit from a school such as AISM. 0 Komentar untuk "Biasiswa AISM 2017-Pre University Scholarship"